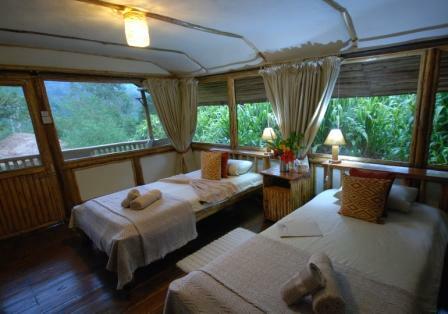 This camp, located on a hillside nestled in the rain forest, is within walking distance of the starting point for the park’s gorilla tracking. A luxury tented camp with eight en suite double rooms, each with two queen sized beds, a private wooden deck and a bathtub with view of the forest, Gorilla Forest Camp provides a beautiful and relaxing setting. Read on…….. Situated on the original “homestead” site at Bwindi, adjacent to the national park, this exclusive lodge has been extensively renovated to offer uninterrupted views of the pristine rain forest canopy. The lodge has eight beautifully appointed and spacious cottages situated along the mountainside, each with its own private veranda. Large comfortable beds ensure a good night’s rest following a tiring day of gorilla tracking. En suite bathrooms are spacious and equipped with flushing toilets and piping hot showers, with the honeymoon cottage boasting a ‘cuddle-tub’. Meals are wholesome and freshly prepared with a variety of international dishes including local specialties such as matoke and g-nut sauce. Unlimited hot beverages are available all day on a self-serve basis and are delivered to your cottage with early morning wake up calls upon request, allowing guests to watch the sun rise over the forest from their own private verandas. Lighting and heating throughout the lodge is solar powered and the lodge’s inviting upper level lounge, bar and dining area, where guests can relax, dine and discuss the day’s events, offers cozy fireplaces providing warmth and comfort in the cool evenings. Read more…. 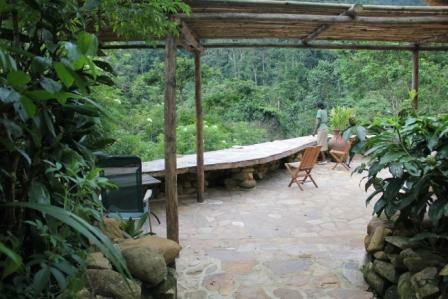 This luxury lodge, located in the Nkuringo section of Bwindi Impenetrable Forest, has eight spacious en suite natural stone rooms including a two room family unit. The lodge has a large reception area, gift shop and bar and six fireplaces located throughout the building to keep guests warm on chilly nights. The lodge’s garden area is a wonderful and comfortable place for guests to relax after a strenuous day of gorilla tracking. 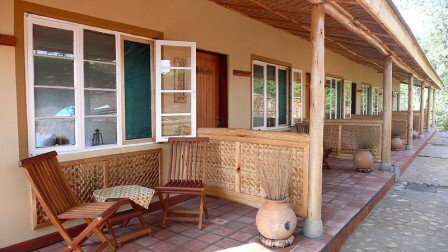 This camp, overlooking Bwindi Impenetrable Forest, has spacious and airy en suite cottages individually styled with local art and products, giving it a true African feel. Designed with eco friendly solar power energy and built into the natural environment, the lodge’s central dining, lounge and bar sit beneath papyrus cover and around a cozy fireplace, providing guests with a perfect place to relax in the evenings. 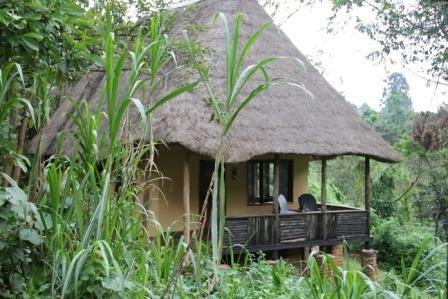 Nkuringo Gorilla Camp, located on Nteko Ridge alongside Bwindi Impenetrable Forest National Park, has both en suite cottages with views of the Virungas and Rift Valley and twin rooms in the camp’s newly built Virunga terrace. The restaurant serves a wide variety of cuisines made with locally produced ingredients. 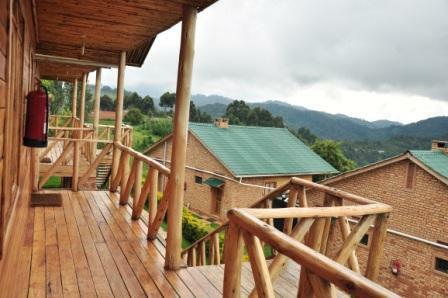 On a clear day, guests have a chance of seeing the Rwenzori Glacier over 160 km in the distance. 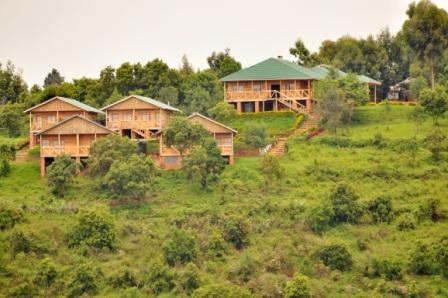 This East African style tented camp, located near Bwindi Impenetrable Forest National Park, has beautiful views of the surrounding landscape. The camp’s central lounge area provides guests with a relaxing place to enjoy sundowners, dine and share stories around the campfire at night. 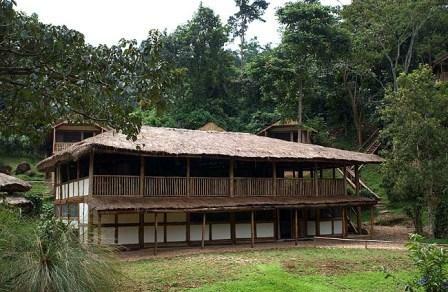 Locally run Bwindi View offers traditional “bandas” built using local and natural materials. 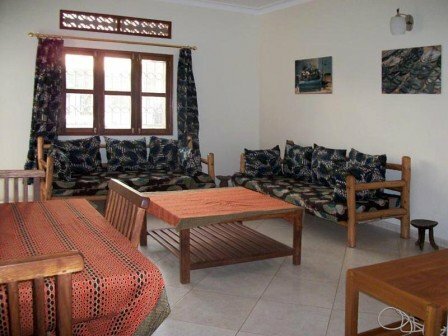 Lodging consists of several buildings with rooms accommodating between two to four people. Bathroom facilities are shared, bedding is provided, and hot water is available for showers. Bwindi View’s restaurant serves hot and cold beverages and freshly cooked local cuisine giving guests a true taste of Uganda. Mahogany Springs offers privacy and serenity blended with optimal comfort in a spectacular setting and is the perfect base from which to begin you Gorilla Tracking or Bird watching adventures. All the rooms are suites with Twin, Double or Triple options offered. These suites are spacious with large double doors and beautiful windows opening onto its own private exquisitely designed terrace with panoramic views of the surrounding area. There are power points in the rooms as well as a dressing table/desk. For added comfort and peace of mind all the suites have an advanced mosquito net system that wraps around the entire area of the beds.Read more………..
On a hill close to Bwindi Forest is Silver Back Lodge with a beautiful view of almost the entire forest. The rooms face the thick forest. Each room was built using local material that provides the true nature of African architecture blended with modern facilities. The lodge has a well stocked bar and a restaurant that serves a variety of meals. The lodge ahs 12 ensuite rooms each with a clear view of the forest.